Yagibushi (八木節) is very popular Bon Dance song. It is local song of Gunma pref. 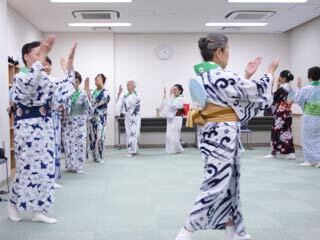 It is very simple rhythmical dance. Face your stomach to the walking direction, and count 4. Close your fingers. Three steps like running. At the last step, you clap. Put right foot left forward, stretch your right arm, and cross your face with left hand. Turn your body to the direction. Then the other side, step left foot to the out side of the circle. Turn your body back to the direction. Bend and stretch arms twice, and Move right foot twice. Step back from right foot and left. Hands up and down.